→ REPLICATOR TAPE ECHO ← Buy your delay pedal online! Two playback heads for three modes of operation. Handcrafted in Denmark. 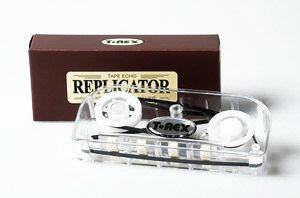 Buy your T-Rex Replicator Tape Delay, guitar effects and spare parts here! There once was a time when a ”bucket brigade” was a handful of firemen and digital processing was only used by computers the size of a house. Echo effects were largely done by using magnetic tape run by a motor – it was such a cool sounding concept, but the size, weight and ease of use was always a challenge for the players. The Replicator is T-Rex Engineering´s take on the ultimate tape echo unit, complete with a motor, magenetic heads and a tape cartridge. The goal was to make a tape echo unit that could nail the sound quality of the old echo units, but surpass them in features. Size, ease of use and super-fast tape replacing were obvious areas of improvement, but we also put in tap tempo, two playback heads for three output modes and a chorus mode that modulates the pitch of the echos. The tape cartridge (available seperately) can be replaced in seconds and the high headroom of the circuit will allow you to use this pedal for processing line signals as well (keyboards, P.A. aux sends, preamps, etc.). The difference between a super precise, accurate digital echo and the Replicator is that there is a certain amount of unpredictability in the sound of tape. It has its own life, almost. And that personality translates into a very natural sounding echo that we think feels more like an instrument than a sound effect. the T-Rex Replicator, user manual, 2 tape cartridges, cotton swabs and power supply with wall socket plugs for world use.